Benidorm has a highly valued marine reserve. Mediterranean Sea is quite and the weather is good throughout the year. Therefore, Benidorm is one of the most popular destinations for diving and nautical activities in general. Some of the aquatic activities that can be done in Benidorm are: diving, snorkeling, kayaking, hookah diving, sailing, fishing, paddle surfing, jet skiing, wakeboarding, water skiing, cable skiing, kite surfing, parasailing… Today, let’s talk about one in particular, the practice of SEA TREK. It is a different underwater experience to enjoy an incredible marine life and zero-gravity while you are at a depth of 5 meters. It is a diving system with a helmet in which you will be walking for 30 minutes. The activity is safe and the helmet offers the best guarantees, as it is developed by Sub Sea System. The company that organize the activity, Diving Stones, has the certificate of quality SICTED (Integral System of Tourist Quality in Spanish Destinations), as well as Camping Armanello. Where can we practice Sea Trek in Benidorm (Alicante)? On Mal Pas beach, which is located in the city center and next to Benidorm’s port. (If you want to know more about this beach or any of the others, we recommend this post about the beaches of Benidorm). Do I need previous experience to play Sea Trek? No, it is one of the advantages of doing this activity since you do not need previous training. In addition, everybody can practice it (recommended from 8 years). 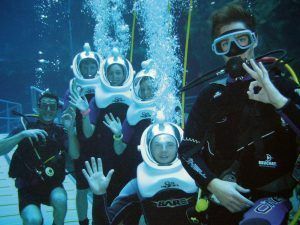 During the whole activity, you are accompanied by a specialized diver and guide. What do I need to do Sea Trek? The company lends you a neoprene if you need it because of the weather. You only have to go with bath clothes and the desire to have fun. If you come to Benidorm, you have a lot of different experiences to live. Enjoy!